If you're in the UK, France, Germany, China, Japan or North America and you're after the new Mac Pro, then you are likely to have a bit of a wait on your hands. Apple has pushed the estimated shipping date for the bin-esque super computer back until April because it's proving just too darn popular. The Mac Pro went on sale in December 2013 after first being teased way back in June of that year, but hit a bit of a snag when the the EU banned sales until Apple sorted out a fan issue. 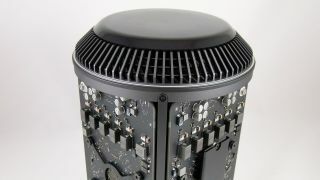 We awarded the Mac Pro 4.5 stars in our official review, for its stellar design and incredible performance. That's despite the starting £2499 ($2999 / AU$3999) price tag not even netting you a keyboard and mouse to go with it. Pfft. Tight.